Mechanical problems accounted for 1,411 of the 3,998 alerts in 2013, followed by signal issues with 1,230. Track problems accounted for 510 alerts, and switch issues were blamed in 438. Power problems accounted for 30 alerts. 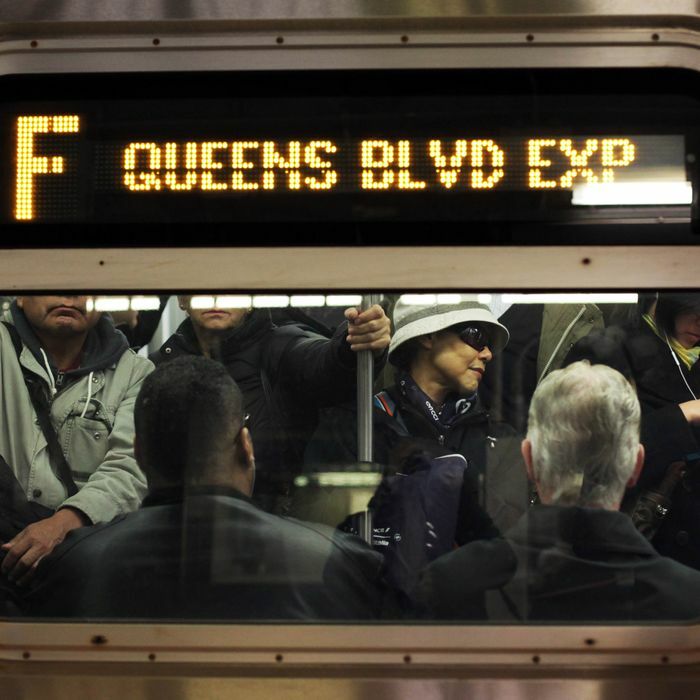 The F line had the most delay alerts in 2013, with 326 alerts, followed by the 4 line, with 298, and the 2, with 289. The J & Z had the fewest, with 1 percent. The L line had the poorest performance from 2011 to 2013, going from 96 delay alerts to 183 alerts. The MTA dismissed the Straphangers’ findings, saying that the electronic alerts shouldn’t be read as “a performance metric.” In a statement, the agency said that it had merely “become more efficient in providing service information in a more timely manner so customers are quickly aware of any incidents that may impact their commute,” noting that “the cause of such incidents can quickly change upon further investigation.” So, either the subway is getting less reliable, or we’re just now learning exactly how unreliable it always was. Either way, the MTA would likely appreciate it if you’d keep your expectations low.